Oceanography before, and after, the advent of satellites (W. Munk). Development and application of satellite retrievals of ocean wave spectra (P. Heimbach, K. Hasselmann). Abstract. The launch of SeaSat in 1978 demonstrated the feasibility of measuring ocean wave heights and imaging the corresponding two-dimensional wave field from space. With the launch of the first European Remote-sensing Satellite (ERS-1) in 1991, wave researchers and operational forecasters obtained global, continuous, quasi-real-time wave data for the first time. This led to the developments of sophisticated, so-called "third-generation" wave models, such as the Wave Model (WAM), and spectral retrieval algorithms for synthetic aperture radar (SAR) data. To achieve these goals, however, significant hurdles had to be overcome. Wave modelers had to develop numerically viable parameterizations of the nonlinear wave-wave interactions. The remote-sensing challenge was to understand and resolve the strong nonlinearities besetting SAR imaging of the moving ocean wave surface. This paper reviews the progress achieved over the last twenty years and summarizes wave data assimilation methods and other current applications of ERS quasi-real-time global SAR wave spectral data or SAR wave-mode product. Two applications are presented. A comparison of wave spectra predicted by WAM with spectra retrieved from ERS-1 on a global scale revealed that WAM overpredicted local wind-generated sea surface heights and underpredicted swell. The former can be largely attributed to wind-forcing errors, while the latter is most likely due to an overly strong swell dissipation in WAM. Assimilation of ERS-1 altimeter sea surface height data into the WAM spectra was found to not alter the qualitative conclusions of the comparison. A second application addresses the trans-ocean propagation of swell. Swell propagating from a storm in the South Pacific is traced over a period of ten days with ERS-1 SAR and compared with model predictions. Wind fields used for wave predictions are also compared with ERS-1 wind scatterometer data. ECMWF wave modeling and satellite altimeter wave data (P. Janssen). Abstract. Satellite altimeter wave height data have important benefits to society: ship routing, fisheries, coastal protection, oil exploration, specification of initial sea state for ocean wave forecasting, and validation of wave forecast. This presentation briefly describes the role of altimeter data in modern ocean wave forecasting. Also, some assumptions to obtain wave height from the radar backscattered pulse are discussed. Comparison of European Remote-sensing Satellite (ERS-2) altimeter wave height data with buoy observations revealed that the ERS-2 wave height is too low by about 7&percent;. The underestimation is discussed and, by using model wave spectra, a method is proposed to remove this problem. The use of satellite surface wind data to improve weather analysis and forecasting at the NASA Data Assimilation Office (R. Atlas, R.N. Hoffman). Abstract. One important application of satellite surface wind observations is to improve the accuracy of weather analyses and forecasts. The first satellite to measure surface wind over the ocean was SeaSat in 1978. The initial impact of satellite surface wind data on weather analysis and forecasting was very small, but extensive research has been conducted since SeaSat to improve data accuracy and utilization of these data in atmospheric models. Satellite surface wind data are now used to detect intense storms over the ocean as well as to improve the overall representation of the wind field in numerical weather prediction models. Satellite wind data contribute to improved warnings for ships at sea and to more accurate global weather forecasts. Experiments with the Goddard Earth Observing System atmospheric general circulation model and data assimilation system indicate that the impact of satellite wind data measured by the National Aeronautics and Space Administration Scatterometer was approximately twice as large as the impact of Special Sensor Microwave Imager or European Remote-sensing Satellite wind data. Locations of cyclones over the ocean were up to 500 km more accurate, and the useful forecast skill in the Southern Hemisphere extra-tropics was extended by 24 hours. Combining altimeter observations and oceanographic data for ocean circulation and climate studies (S.L. Garzoli, G.J. Goni). Abstract. Calibrating Topography Experiment (TOPEX)/Poseidon (T/P) altimeter data to inverted echo sounder measurements is one of the methodologies developed to advance the study of the South Atlantic Ocean. The mass transport of the main boundary currents can be monitored using dynamic height time series obtained from altimeter-derived sea surface height anomalies. A 2-layer model yields upper-layer thickness and surface dynamic height of the ocean in areas of strong vertical stratification to identify and track anticyclonic rings, such as those shed from the Agulhas retroflection, which play an important role in the interocean exchange of heat and mass. Interannual variability of boundary currents, derived from analysis of the first five years of T/P data, is discussed. A combination of T/P data and in-situ observations provides significant contributions to the study of ocean dynamics for climate applications. Remote sensing of oceanic extra-tropical Rossby waves (P. Cipollini et al.). Abstract. Long baroclinic Rossby waves play a fundamental role in ocean dynamics and can dramatically affect weather patterns and climate. In recent years, satellite remote sensing has provided a global picture of these propagating signals, which are characterized by very large wavelengths (hundreds or thousands of km) and small surface signatures (a few cm). After presenting the basics of Rossby wave theory, we review the results obtained so far from satellite observations and briefly summarize recent suggested revisions to the standard linear theory of Rossby wave propagation. We then describe the processing and the corrections applied to global datasets of altimeter and sea surface temperature data to make them suitable for Rossby wave analysis. We discuss the importance of Rossby wave studies for the validation of ocean circulation models, and present a brief comparison between satellite-observed and model-derived waves. Finally, we consider possible future developments of Rossby wave research, which will improve our knowledge about how the oceans respond to atmospheric forcing and climatic events. A study of meddies using simultaneous in-situ and satellite observations (P.B. Oliveira et al.). Abstract. Data from the National Oceanic and Atmospheric Administration (NOAA) and Topography Experiment (TOPEX)/Poseidon (T/P) satellites, a surface drifter, and subsurface floats, named RAFOS, at a depth of ~1000 m in the Mediterranean Undercurrent were used to investigate Mediterranean Water eddies, or meddies, off the southwest coast of Portugal. Analysis of RAFOS trajectories and simultaneous distributions of NOAA Advanced Very-High Resolution Radiometer (AVHRR) sea surface temperature (SST) and T/P sea level anomalies revealed that meddies frequently have a signature in the surface thermal field. Characteristics of these signatures include clockwise wrapping of filament structures around the eddy periphery and higher sea level anomalies of ~10 cm. A sequence of six SST images, taken between 14 March and 2 May 1994, was compared with contemporaneous 11-day trajectories of selected RAFOS floats to investigate the eddy-like features of the SST field in relation to eddy motion in the Mediterranean Undercurrent. The structure and evolution of submesoscale cyclonic and anticyclonic structures identified in the SST field were found to reflect mid-depth flow structures with similar features, as revealed by the RAFOS trajectories. This approach yielded relevant clues to the interpretation of the movement of meddies: namely, their irregular trajectories with stops and sudden changes in direction that could be attributed to their interaction with other vortices. Why care about El Niño and La Niña? (M.H. Glantz). Abstract. At the time of writing this chapter in February 2000, many aspects of global weather were under the influence of a cold sea surface temperature event along the equator in the eastern Pacific Ocean. This type of event is known as La Niña. The cold event began in mid-1998, following on the heels of the most intense and damaging warm event, or El Niño, of the twentieth century. El Niño and La Niña are important applications of satellite data, as described elsewhere in this book. Episodes of El Niño and La Niña occur at approximately 3-7 year intervals to disrupt human activities worldwide in both positive and negative ways. The structure, content, and approach taken for this chapter reflect my desire to produce a concise overview of many attributes regarding El Niño and La Niña, which could be reproduced for presentation to various audiences, from university students to researchers in other disciplines, to policy makers, and to the public. Each page provides a brief stand-alone explanation of characteristics of El Niño and La Niña. The chapter begins with a brief description of how the public learned about "El Niño" and "La Niña" from the media, which is credited with rapidly informing the public about the impacts of El Niño and La Niña. It seems that nearly everyone has heard of "El Niño" and "La Niña," but very few know what El Niño and La Niña are, what they do, and why societies should care about them. Since early 1997, oceanographers and meteorologists readily learned the difficulties inherent in explaining the complex ocean-atmosphere interaction process of El Niño or La Niña in a few words or in 15-second interviews. The second part is a succinct description of the El Niño and La Niña phenomena. Then four El Niño and La Niña impacts are shown: marine living resources, excessive rainfall, drought-related wildfires, and hurricanes. The chapter concludes with some general lessons about El Niño and La Niña. Satellites, society, and the Peruvian fisheries during the 1997-1998 El Niño (M.-E. Carr, K. Broad). Abstract. The evolution of oceanographic conditions off Peru during 1996-1998, including the 1997-1998 El Niño, is studied with in-situ data from coastal tide gauges and with satellite data from the Advanced Very-High Resolution Radiometer (AVHRR), European Remote-sensing Satellite (ERS), National Aeronautics and Space Administration (NASA) Scatterometer (NSCAT), Ocean Color and Temperature Scanner (OCTS), and Sea-viewing Wide Field-of-view Sensor (SeaWiFS). Maximum anomalies of in-situ sea level (>22 cm) and sea surface temperature (SST) (>4°C) occurred near Callao at 12°S in June-July 1997 and December 1997-January 1998. Scalar wind speed at the coast increased between May 1997 and June 1998, indicating the anomalous oceanographic conditions do not result from cessation of coastal upwelling. Monthly unrestricted catch of small pelagic fish surpassed 1 million tons between December 1996 and June 1997, as catchability increased during the onset of warm conditions. Satellite data contributed to a recognition that the anomalous conditions in April-June 1997, which facilitated unseasonably high catches, were part of a large-scale perturbation. This spurred the implementation of regulatory mechanisms to protect the stock, despite strong opposition from the fishing industry. However, later in the event, misinterpretation of satellite data led to premature claims that El Niño was ending and subsequent poor decision-making and confusion by different actors in society. The prediction of return to normal conditions was premature, as the second peak of the El Niño arrived in December 1997-January 1998. Observations and numerical model simulations from a planktonic ecosystem model are compared with variations of the Peruvian catch of small pelagic fish to quantify the impact of El Niño on pelagic fish catch. The two highest correlation coefficients, r, computed between monthly fish catch and several biological and physical variables were associated with cross-shelf SST difference (r = -0.55) and modeled food available for fish (r = 0.50). Satellites and fisheries: the Namibian hake, a case study (A. Gordoa et al.). Abstract. Remote sensing is an important facet of fishery research and fishing operations because oceanographic conditions strongly influence natural fluctuations of fish stocks. Accordingly, satellite capabilities in fisheries have been long emphasized. Applications of satellite remote-sensing capabilities for fisheries from 1987 to 1998 are reviewed, emphasizing the relationship between sea surface temperature and hake availability in Namibian waters. Ocean-color satellites and the phytoplankton-dust connection (P.M. Stegmann). Abstract. Results of a time series of satellite measurements of aerosol radiance made with two ocean-color sensors are presented. Data from the Coastal Zone Color Scanner (CZCS) were collected from 1978 to 1986. The follow-on sensor, the Sea-viewing Wide Field-of-view Sensor (SeaWiFS), has been transmitting data since September 1997. Both CZCS and SeaWiFS images successfully depicted regions of well-known, large-scale mineral aerosol plumes, the seasonality of which corresponds to that found by other satellite and land-based platforms. Aerosol radiance extractions were made for two subregions in the North Atlantic, both of which are recipients of regular mineral aerosol deposits originating from northwest Africa. In the almost eight-year time series obtained with CZCS, the annual cycle in both subregions follows a similar pattern each year and agrees well with results from the published literature. However, there is interannual variability and the observed fluctuations may be linked to climatic shifts associated with the North Atlantic Oscillation. The SeaWiFS annual cycle of aerosol radiance in both subregions closely followed that found in the CZCS climatology; SeaWiFS-measured aerosol optical thickness mirrors aerosol radiance to a high degree. The higher temporal resolution offered by the SeaWiFS data demonstrates the sporadic nature of dust events throughout the entire year and not only during the high dust season. An overview of temporal and spatial patterns in satellite-derived chlorophyll-a imagery and their relation to ocean processes (J.A. Yoder). Abstract. Satellite measurements of water-leaving radiance, from which estimates of phytoplankton chlorophyll-a are derived, began with the launch of the Coastal Zone Color Scanner (CZCS) in 1978. Global CZCS data were widely distributed beginning in 1988, providing oceanographers a new tool for studying temporal and spatial variability in surface waters of the global ocean. CZCS imagery, and that from more recently launched sensors, has been extensively used for studies of variability at spatial scales from <10 km to the global ocean and for temporal scales ranging from days to years. Ocean margin waters have particularly strong signatures in chlorophyll-a images, and the imagery has been effectively used to study a wide range of environments, including coastal upwelling systems and river plumes. Chlorophyll-a imagery is the only tool for observing the mean- and time-varying components of a biological variable at ocean basin to global ocean scales. Basin-to-global scale composite images are used as input to calculate primary production and to describe and quantify seasonal cycles on a global scale. Such images are also one of the important data sources for understanding how physical processes affect biological distributions on ocean basin and global scales, e.g., the impact of major ocean perturbations such as El Niño. Future sensors, as well as new capabilities to merge data from different sensors, will provide better accuracy and better coverage, thereby extending scientific and other applications in coastal and open ocean waters. Remote-sensing studies of the exceptional summer of 1997 in the Baltic Sea: the warmest August of the century, the Oder flood, and phytoplankton blooms (H. Siegel, M. Gerth). Abstract. The summer of 1997 was exceptional in the Baltic Sea. Stable high pressure over Scandinavia in the first 10 days of August, associated with high solar radiation, resulted in the highest air and water temperatures of this century. These warm and calm conditions were favorable for a strong bloom of cyanobacteria in the southern Gotland Sea. In addition, two strong rainfall periods in the drainage area of the Oder River caused the century's most extensive regional flooding, with floodwaters reaching the Pomeranian Bight in August. Satellite data from different sensors and spectral ranges were used to study these special events. The monthly mean summer sea surface temperature (SST) distribution for the years 1990-1998, as derived from the National Oceanic and Atmospheric Administration (NOAA) Advanced Very-High Resolution Radiometer (AVHRR) data, showed a large interannual variation. The mean SST in the Baltic Sea exceeded 22°C in August 1997, the warmest month of the 1990s. In addition to SST, visible data from NOAA AVHRR and Indian Remote-Sensing Satellites (IRS-P3 and IRS-1C) Multispectral Optical Sensor (MOS) and Wide Field Sensor (WiFS) were used to investigate the blooms of cyanobacteria and coccolithophores and the distribution of river discharge during the Oder flood. Remote-sensing studies of seasonal variations of surface chlorophyll-a concentration in the Black Sea (N.P. Nezlin). Abstract. Seasonal variations of Sea-viewing Wide Field-of-view Sensor (SeaWiFS) and Coastal Zone Color Scanner (CZCS) measurements of surface chlorophyll-a concentration in the Black Sea are described. For areas where the water depth is greater than 200 m, surface chlorophyll-a concentration was maximum in winter. SeaWiFS surface chlorophyll-a concentrations in 1997-1998 were larger than CZCS data in 1978-1986; the change seems to result from both eutrophication and long-term climatic oscillations. In 1997-1998, the maximum surface chlorophyll-a concentration occurred during autumn instead of winter-spring; this seems to result from Danube River runoff, which is maximum in August 1997; the possible mechanism of this influence is discussed. Remotely sensed coastal/deep-basin water exchange processes in the Black Sea surface layer (A.I. Ginzburg et al.). Abstract. The role of mesoscale structures (eddies, dipoles, jets) in horizontal mixing and coastal/deep-basin water exchange in the Black Sea was investigated with National Oceanic and Atmospheric Administration (NOAA) Advanced Very-High Resolution Radiometer (AVHRR) imagery during 1993 and 1996-1998, together with relevant mean-daily meteorological data from seaports and available hydrographic data of different years. In summer 1993 two anticyclones with diameters of about 90 and 55 km co-existed without coalescence over the northwestern continental slope. Cyclones at the eddies' peripheries, entrained and ejected jets, filaments, and a pinched-off cyclone near Cape Hersones (44°35'N, 33°22'E) associated with wind-driven coastal upwelling contributed to the water exchange in the region. Four anticyclones about 50 km in diameter and associated cyclones at their peripheries were observed in the southeastern region in November 1996. Surface circulation in the region was considerably changed over several days because of the anticyclones' movements, and formations and disruptions of short-lived dipoles of anticyclones and associated cyclones at their peripheries. Near-shore anticyclonic eddies with diameters of 40-80 km and lifetimes up to one month, which form along the Caucasian coast and propagate with velocities up to 17 cm s-1 in the general direction of the Rim Current, can evolve into deep-sea eddies southwest of Novorossiisk. Offshore jets, up to about 200 km in length and associated with the anticyclones, are an effective mechanism of coastal/deep-basin water exchange in the northeastern region. Satellite-derived flow characteristics of the Caspian Sea (H.&Idot;. Sur et al.). Abstract. Mesoscale dynamics of the Caspian Sea are analyzed with satellite data to capture rapid submesoscale motions not sufficiently resolved by in-situ measurements. A combination of Sea-viewing Wide Field-of-view Sensor (SeaWiFS) ocean color data and Advanced Very-High Resolution Radiometer (AVHRR) sea surface temperature (SST) measurements provide a novel evaluation of marine biogeochemical and physical processes and their forcing mechanisms. The main feature of the Caspian Sea is higher pigment concentration with respect to other basins in the Mediterranean region. SeaWiFS detects riverine sediments introduced into the Caspian Sea by the Ural, Terek, Volga, and other rivers, and planktonic flora created in the Caspian Sea by nutrient-rich river runoff. The influence of river flow into the north-northwestern shelf area is especially evident after springtime flooding. Runoff from the Volga River has a major impact on the biomass in the northern Caspian Sea. Eddies and river plumes in coastal waters transport materials and momentum into the Caspian's northern and middle basins. In winter, the cyclonic (counterclockwise) circulation leads to much higher SST in the eastern part of the Caspian than in the west. In summer, wind-induced upwelling yields a pronounced decrease in temperature and higher biomass in the upper layer of the eastern Caspian Sea. In spring, cold water is formed over the entire northern Caspian Sea. Analyzing the 1993-1998 interannual variability of NCEP model ocean simulations: the contribution of TOPEX/Poseidon observations (R.W. Reynolds et al.). Abstract. The National Centers for Environmental Prediction climate forecast system for El Niño Southern Oscillation (ENSO) includes a coupled ocean and atmosphere general circulation model. A critical element for a skillful forecast of ENSO is accurate initialization of the tropical Pacific Ocean component of the coupled system. For accurate ocean analyses, assimilation of both in-situ and satellite data is required to correct ocean model biases and to better capture sea surface temperature (SST) variability. Our results suggest that Topography Experiment (TOPEX)/Poseidon (T/P) sea level data have a strong potential for improving ocean analyses and coupled forecasts, in the same way that assimilation of T/P data improved model sea level. However, our present assimilation scheme corrects only temperature; T/P data can, therefore, only influence temperature. In the western tropical Pacific, salinity is an important contribution to sea level. Thus, T/P data need to be correctly partitioned between temperature and salinity for more accurate ocean analyses. Recent progress toward satellite measurements of the global sea surface salinity field (G.S.E. Lagerloef). Abstract. With present and incipient technology, it appears to be possible to map the global surface salinity field on climatological scales from satellites. Measurements would be made with passive microwave radiometry at 1-3 GHz (L- and S-bands), which are frequencies also used for soil moisture measurements. There may be additional scientific value for sea ice observations. Studies are being done to assess the scientific importance and applications of global surface salinity measurements, and to evaluate the potential accuracy and spatio-temporal resolution with present and near-future technologies. Three principal scientific objectives have been identified as: (1) Improving seasonal to interannual (e.g., El Niño and La Niña) climate predictions; (2) Improving ocean rainfall estimates and global hydrologic budgets; and (3) Monitoring large-scale salinity events. The assimilation of surface salinity data into ocean and climate models provides an important tool for addressing these scientific issues. Technical problems include radiometer systems and calibration, ambient corrections, algorithms, satellite systems, and orbit mechanics. Several radiometer designs are being considered. Retrieval simulations for one sensor, including the major sensor and geophysical error sources, predict errors of about 0.1 practical salinity units (psu, equivalent to grams of salt per kilogram seawater or parts per thousand, 0/00) in equatorial areas and about 0.2 psu at high latitudes, for 100-km and monthly averages. This assumes mostly uncorrelated error and could be further reduced by larger area averages. Such observations represent a significant advance in global ocean remote-sensing capability for climate research. Sea surface salinity: toward an operational remote-sensing system (D.M. Le Vine et al.). Abstract. Salinity is an important component of biological and physical processes in the ocean, but its distribution throughout the ocean is poorly known. Passive microwave sensors are capable of measuring sea surface salinity, and recent advances in technology suggest that such measurements may soon be feasible on a global basis from Earth orbit. Aircraft-mounted instruments have been developed to validate the technology and address the problem of developing robust algorithms for remote sensing of sea surface salinity. Two aircraft instruments, the Scanning Low Frequency Microwave Radiometer (SLFMR) and the Electronically Scanned Thinned Array Radiometer (ESTAR), have successfully demonstrated remote sensing of salinity in the coastal ocean. Sensors for monitoring salinity from space that utilize the thinned array technology demonstrated by ESTAR have recently been proposed to the National Aeronautics and Space Administration and the European Space Agency. Appendix I. List of acronyms. Appendix II. Program of the International Conference on Satellites, Oceanography and Society. The book shows how the new observations from satellites required advances in theory and influenced societal decision-making. Chapters have a review with an extensive reference list, making the book an excellent source of information for biological and physical oceanographers and atmospheric scientists. 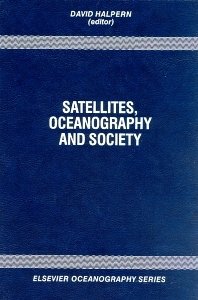 A large range of state-of-the art applications of satellite data (altimeter, color, infrared radiometer, scatterometer, synthetic aperture radar) visible in regional-to-global scale ocean studies integrating satellite and in-situ measurements with circulation models are covered in the book. Subjects include forecasting of surface waves, both swell and windsea, and surface wind; El Niño/La Niña; exchange of water masses between ocean basins, Rossby waves; eddies and filaments; fisheries; coastal ocean dynamics; phytoplankton dynamics; and ideas to measure sea surface salinity. For biological and physical oceanographers and atmospheric scientists, researchers, graduate students, space agencies and those interested in oceanographic research.